It’s springtime in south Louisiana, or is it? Clovis Crawfish isn’t about to wait around in his mudhouse to find out! 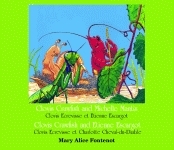 He sticks his head and whiskers outside the opening to his mudhouse and finds Rosalie Redbird and Christophe Cricket singing about the arrival of le printemps (spring). But if spring has arrived, where are René Rainfrog, Gaston Grasshopper, and Josette June Bug? Clovis decides to head for the swamp to find out. There he meets Simeon Suce-Fleur, a tiny hummingbird who is looking for threads to build her nest, and wise old Henri Hibou (Henry Owl), who warns Clovis that it is not yet spring. When tiny flakes of snow begin to fall, Clovis discovers that Henri Hibou was right, and dashes back to the warmth of his mudhole. But when he arrives, he sees Simeon Suce-Fleur lying on the ground, shivering from the cold. Has he arrived in time to save the little hummingbird, and what will Clovis do? Scott R. Blazek resides in Clovis, New Mexico, where he is a Lutheran minister and an award-winning freelance artist. He was awarded a $2,500 prize from the U.S. Mint for designing a five-dollar gold coin featuring James Madison for their Bill of Rights Commemorative Coins set. 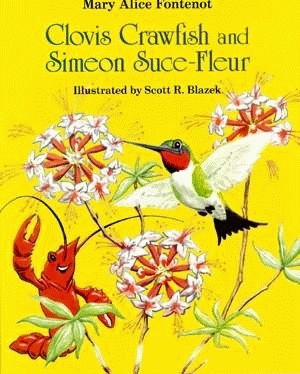 Clovis Crawfish, a Cajun Crawfish is the main character of the book. Clovis knows and talks to all the other creatures found in the Louisiana swamps. Clovis is very sensitive to the needs of all his friends and looks out for their safety.